It is always an exciting time when a new addition is made to your family. Whether it be a puppy or kitten, or any other sort of pet, there are a few things that are important to do before their arrival. The most important thing to remember is to have your pet seen by a veterinarian before introducing them to your household. Cats and kittens can have upper respiratory infections that are very contagious to other cats. It is also important to have any new cat or kittens tested for Feline Leukemia and Feline FIV. They are both extremely contagious diseases that are eventually fatal. Dogs can also have diseases such as kennel Cough and Parvo that can be contagious to other dogs. dewormers only work for certain types of round worms. Your veterinarian can test a sample of stool from your new pet and prescribe the most effective dewormer. Now that the health of your pet has been checked, you are almost ready to bring them home. For Younger animals the next step is to puppy or kitten proof your home. Puppy's and kitten are very curious creatures much like babies. Make sure that all cleaning supplies and harmful plants are safely and securely stored away, or removed from harms way. It is also important to hide any electrical cords that your pet may have a desire to chew on and to cover electrical outlets with plug covers. Chewing live wires could lead to severe mouth burns or worse, electrocution. Small items such as buttons, needles, beads, nails, thumbtacks, paper clips, yarn and thread should all be kept in well sealed containers. If swallowed, such items could be harmful to your pet. Adult dogs or cats need slightly different preparations. Be sure to have a small room or kennel area set up for your new pet. Coming into a new household can be frightening, but having an area of their own that is quiet and secure can help them to adjust to their new environment. Make sure they have their own food and water bowel that can easily be found. Now you are ready to bring home your new pet. Once home, socialization is needed to introduce your puppy or kitten to your family and also to other pets. In introducing the pet to children it is good to remember a few simple tips. First is a slow introduction starting with several short periods of time. Teach the child the proper way to hold your pet, and the proper way to pick him up. They also need to learn that grabbing an animal by his tail or ears is wrong. If frightened a puppy or kitten may try to protect himself by scratching or biting. In introducing them to other pets the same rules of thumb apply as with children. 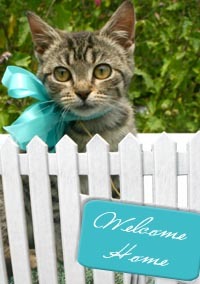 Most pets, cats, dogs or both, if introduced slowly will accept a new pet into the household. However, it is wise not to leave them alone until you are sure that they will get along. Start with supervised socialization, with both pets either on leashes or separated by some sort of barrier, (carriers, fence, baby gates etc) so that they may get acquainted without any worry of injury.